CO 28 STS holding 4 strands together. Work in stockinette stitch (*K1 row, P1 row*)until blanket measures 36” long. BO. Adding a fringe is optional. Finished dimensions are approximately 2’x3’. For the blanket pictured I used Lion Brand Jiffy Solids in Blue (“Slate” 151), Purple (“Grape” 138), Gray (“Dark Gray Heather” 159). I’m normally not a fan of acrylic but for a blanket that’s going to suffer all kinds of toddler abuse, it’s nice to have something that can be put in the washer and dryer as often as needed. This entry was posted in Knitting, PATTERNS and tagged knitting. Bookmark the permalink. I might try thiis one! Really cute. 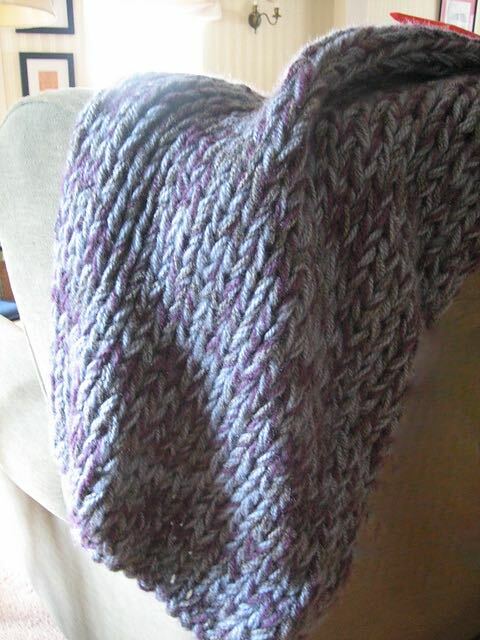 Cool…never thought of putting stockinette stitch in a throw. I bet that makes it super-warm and extra stretchy too. Nice!